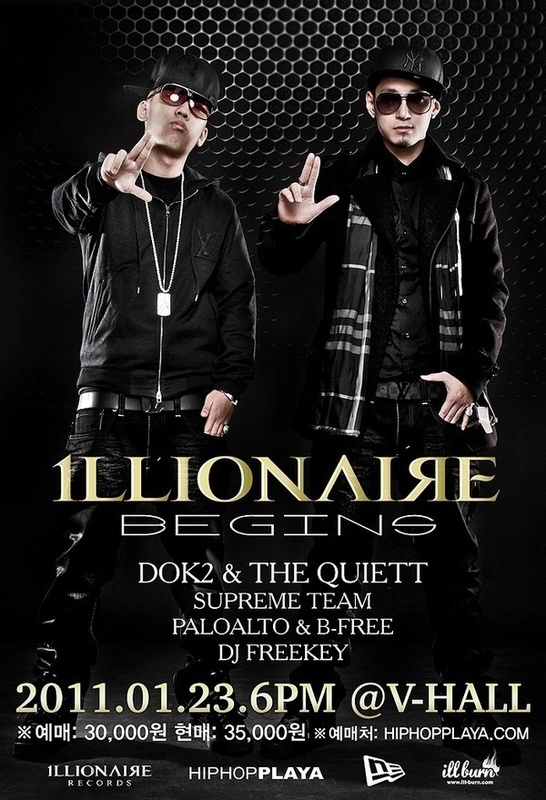 CEO of the new and highly-anticipated hip-hop label ILLIONAIRE and hip-hop artist The Quiett announced ILLIONAIRE‘s first concert: ILLIONAIRE BEGINS. According to his recent tweet, the first ILLIONAIRE concert is to be performed on January 23, 2011 (his tweet says 2010, but I’m fairly certain that was a typo). More detail about the concert will be followed soon. Edit #1: Poster for the concert has been released (see above). ILLIONAIRE’s first show will be performed at V-Hall in Hongdae, Seoul and features artists including Simon Dominic and E-Sens of Supreme Team, Paloalto, B-Free, and DJ Freekey. According to DOK2 (via Twitter), pre-sale tickets will be available soon, so keep an eye out for it! pre-sale tickets are available now for purchase at HIPHOPPLAYA. Make sure to purchase them as soon as possible!